Mortgage duty is imposed under Chapter 7 of the Duties Act 1997 (the Duties Act) on instruments of security by way of mortgage or charge over property wholly or partly in New South Wales (NSW). Duty is payable on the amount secured by the mortgage at each liability date. Under section 208 a liability arises on the date of execution of a mortgage, and on the date of making an advance or further advance if as a result of that advance the amount secured by the mortgage exceeds the amount secured by the mortgage at the time a liability to duty last arose. The State Revenue Legislation Further Amendment Act 2009 introduced new provisions to simplify the calculation of mortgage duty. Most of these changes are covered by Revenue Ruling DUT 039. This ruling outlines how Chapter 7 (Mortgage Duty) and Chapter 11A (Tax Avoidance Schemes) of the Duties Act will be applied in relation to certain transactions as part of deferred purchase price arrangements. Under a deferred purchase price arrangement financial accommodation is provided as a result of a financier acquiring and selling loan notes or another type of debt instrument. The arrangements are generally called a “deferred purchase price scheme” or a “no advance” structure. A mortgage is granted to secure the obligation to pay the deferred purchase price, rather than an “advance” as defined in the Duties Act. For the remainder of this ruling, such a deferred purchase price arrangement will be referred to as a DPP scheme. a special purpose vehicle (SPV) which is related to A. If the financial accommodation had been provided by way of a loan, rather than a DPP scheme, B would have been the lender and C would have been the borrower. C pays the funds to B over time, by way of instalments of purchase price, plus interest. 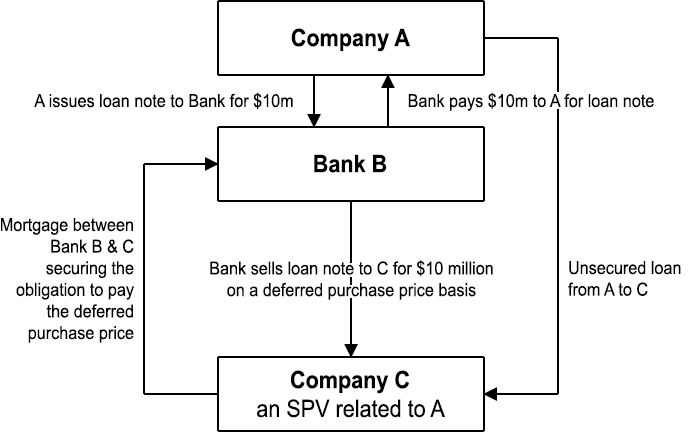 The diagram below is an illustration of a simple DPP scheme. Since the introduction of the State Revenue Legislation Further Amendment Act 2009 questions have arisen as to whether financial accommodation provided under DPP schemes are subject to duty under Chapter 7 (Mortgage Duty) or Chapter 11A (Tax Avoidance Schemes) and how the transitional provisions for these chapters apply. application of Chapter 7 of the Duties Act to DPP schemes from 1 July 2009 will require consideration of all the relevant circumstances of the scheme to determine liability of transactions including a draw down, further security and rollover. The application of Chapter 11A of the Duties Act to any particular arrangement depends on a careful weighing of all the relevant circumstances of the arrangement and the relative weight that should be attached to each of those circumstances. Therefore, in the absence of all the relevant information, it is not possible to state definitively whether Chapter 11A will apply in a particular case. However, it is the Chief Commissioner’s view that Chapter 11A is likely to apply to DPP schemes on the basis that they are artificial, blatant or contrived provided that, in a particular case, what was done comprised a tax avoidance scheme as defined in Chapter 11A. is carried out on or after 1 July 2009 (regardless of when it was first entered into or made). However, Chapter 11A does not apply to any amount of duty avoided by a person as a result of a tax avoidance scheme if, apart from the scheme, liability for the duty concerned would have arisen before 1 July 2009. style="list-style-type: lower-alpha;"
Where a claim is made that the duty otherwise payable under Chapter 11A should be reduced under clause 78 by reference to an “amount of duty avoided by a person as a result of a tax avoidance scheme”, the basis on which that amount is calculated will need to be provided, including details of the liability date or dates, and the proportion of NSW secured property at that date or dates, where relevant. The provision of financial accommodation on or after 1 July 2009 under a DPP scheme is considered to be liable to duty at mortgage rates on the amount of the drawdown, with the liability arising on the date the drawdown occurs. In relation to the example in paragraph 6 above, the drawdown would be taken to have occurred when B paid the subscription moneys for the loan notes. Where a DPP scheme was put in place prior to 1 July 2009 it is necessary to consider clause 78 of the transitional provisions. There is a facility for $100m under a DPP scheme which was fully drawn as at 1 July 2009. After 1 July 2009, the amount of the facility is extended and another $20m is drawn down. In this example duty is payable on the $20m draw down. Where there is a dutiable “advance”, duty will be assessed under Chapter 7. Where there is no dutiable “advance” duty will be assessed under Chapter 11A on the basis that the drawdown would be considered to be made under a tax avoidance scheme which, for the purposes of clause 78(1) of the transitional provisions, was partially carried out on or after 1 July 2009. For the purposes of clause 78(2), the duty on $20m payable as a result of the drawdown would not be considered to be an amount of duty avoided as a result of the scheme in respect of which a liability would have arisen before 1 July 2009, but for the scheme. There is a facility for $100m under a DPP scheme which was only drawn down to $80m as at 1 July 2009. After 1 July 2009 a further $5m is drawn down. In this example duty is payable on the $5m post 1 July drawdown. Whether the liability arises under Chapter 7 or Chapter 11A will depend on the scheme arrangements and documentation. There is a facility for $100m under a DPP scheme which was fully drawn as at 1 January 2009. As at 30 June 2009 $80m was outstanding. On 1 August 2009 a further $10m was drawn down. However, if there is no liability under Chapter 7 the duty, if any, payable under Chapter 11A as a result of the $10m drawdown would depend on the operation of clause 78. If there in no increase in the proportion of NSW secured property on or after 1 July 2009, there would be no duty payable under Chapter 11A as a result of the $10m drawdown. This is because the amount of duty payable on the total amount secured following the $10m drawdown (namely duty on $90,000) would be less than the amount of duty avoided as a result of the scheme in respect of which a liability would have arisen before 1 July 2009, but for the scheme (namely duty on $100m). additional mortgages are granted by way of further security on or after that date the grant of the additional mortgages will be considered to be part of a tax avoidance scheme carried out on or after 1 July 2009. The ad valorem duty payable under Chapter 11A as a consequence of the provision of additional security will depend on the operation of clause 78. For example, if the additional mortgages increase the proportion of secured property in NSW such that the duty exceeds the “amount of duty avoided by a person as a result of a tax avoidance scheme” then duty will be payable. If the due date for payment of a deferred purchase price under a DPP scheme is extended on or after 1 July 2009, liability for duty will depend on whether there is an “advance” under section 206 in the form of a forbearance which results in an increase in the amount secured at the time a liability for duty last arose or, alternatively, whether the extension is part of a tax avoidance scheme that is carried out on or after 1 July 2009. Whether there is an advance in the form of a forbearance is not considered to depend on whether or not the extension is agreed before or after the due date (see Tozer’s case (1961) 78WN (NSW) 250 at 258). documentation evidencing the movement of funds. Where mortgages of the kind referred to in this ruling are lodged for stamping on the basis that duty is payable, the lodging party should indicate whether they are lodged for assessment under Chapter 7, under Chapter 11A or by way of compromise assessment. the scheme’s sole or dominant purpose was to reduce liability for mortgage duty. Such acknowledgements will permit an assessment under Chapter 11A to be issued, accompanied by a statement under s284H of the Act, without further investigation. Where mortgages are lodged for assessment under Chapter 11A but the acknowledgements referred to in the previous paragraph are not provided, further investigation will be required before the mortgages can be stamped. That investigation would normally require the lodging party to provide the documentation and disclosures referred to in paragraph 20 above. In addition, a statutory declaration from the mortgagor (or responsible officer of the mortgagor, as the case may be) will be required which states why financial accommodation was provided using a DPP scheme. In particular, it should set out the reason or reasons why a DPP scheme was adopted, rather than some other approach, such as a secured loan facility or bill facility. A statement that a DPP scheme was used for the purpose of obtaining financial accommodation will not be regarded as relevant. It is considered that the provision of financial accommodation may be the reason why relevant parties transact, but not the reason why one form of transaction is used rather than another. If the lodging party considers that it will be difficult or impractical for the Chief Commissioner to determine the tax liability under the Duties Act without undue delay or expense because of the complexity or uncertainty of the case, consideration will be given to stamping the documents by way of compromise assessment under s12 of the Taxation Administration Act 1996. Because of possible uncertainty, prior to the issue of this ruling, as to how the relevant statutory provisions would be administered in relation to mortgages forming part of a DPP scheme, interest and penalty tax otherwise payable for late payment of duty in respect of such mortgages will be remitted where duty is paid on or before 28 February 2010 on the basis set out in this ruling. All matters referred to in this ruling should be lodged for review with the Principal Advisor Revenue Advisory Services Division 1 of the Office of State Revenue.